Part 1 Identifying risks: Pathogens in vegetables; Pathogens in fruit; Measuring microbiological contamination in fruit and vegetables; Pesticide residues in fruit and vegetables; The rapid detection of pesticide residues. Part 2 Managing risks: Risk management in the supply chain for fresh fruit and vegetables; Good agricultural practice and HACCP in fruit and vegetable cultivation; Implementing on-farm food safety programs in fruit and vegetable cultivation; Alternatives to pesticides in fruit and vegetable cultivation; Improving the safety of organic vegetables. Part 3 Preservation techniques: Alternatives to hypochlorite washing systems for the decontamination of fresh fruit and vegetables; Ozone decontamination of fresh fruit and vegetables; Irradiation of fresh fruit and vegetables; Thermal treatments of fresh fruit and vegetables; Antimicrobial films and coatings for fresh fruit and vegetables; Modified atmosphere packaging and the safety and quality of fresh fruit and vegetables; Natural antimicrobials for preserving fresh fruit and vegetables; Consumer risk in storage and shipping of raw fruits and vegetables; Combined preservation techniques for fresh fruit and vegetables. Fresh fruit and vegetables have been identified as a significant source of pathogens and chemical contaminants. As a result, there has been a wealth of research on identifying and controlling hazards at all stages in the supply chain. Improving the safety of fresh fruit and vegetables reviews this research and its implications for food processors. Part one reviews the major hazards affecting fruit and vegetables such as pathogens and pesticide residues. Building on this foundation, Part two discusses ways of controlling these hazards through such techniques as HACCP and risk assessment. The final part of the book analyses the range of decontamination and preservation techniques available, from alternatives to hypochlorite washing systems and ozone decontamination to good practice in storage and transport. 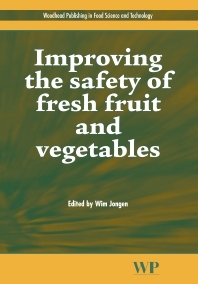 With its distinguished editor and international team of contributors, Improving the safety of fresh fruit and vegetables is a standard reference for all those involved in fruit and vegetable production and processing. Professor Wim Jongen is Head of the Product Design and Quality Management Group at Wageningen Agricultural University. He is also Scientific Director of the prestigious Agrotechnological Research Institute (ATO).